Do you need a calming, soothing sanctuary to truly release the end of holiday stress and wildness? If so, this weekend retreat has your name on it. Join Megha at Garden of the Heart Yoga Center in beautiful Sarasota, Florida for a special opportunity to come home to yourself. 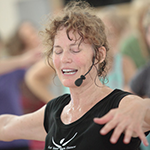 Discover the time-honored tradition of Kripalu Yoga meditation in motion, ancient and easy Qi Gong practices, and unique moving meditations to bring you back to your body, your heart, your spirit. $99 Before New Year’s Eve, Dec. 31, 2018.